Overview - True story of Heinrich Harrer, an Austrian mountain climber who became friends with the Dalai Lama at the time of China's takeover of Tibet. Despite its philosophical desire for peace and freedom, Tibet has found itself embroiled in a significant conflict with China that has only intensified since the 13th century. This dispute is based on each nation's varying accounts of history, their separate claims to Tibet as a nation, and wildly different perspectives on the legitimacy of Tibet's liberation. In 1959, the 14th Dalai Lama fled Tibet and formed an exile government in northern India that continues to fight China's claim to their homeland to this day. 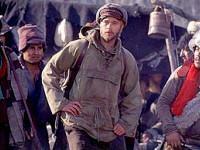 'Seven Years in Tibet' tells the true story of Heinrich Harrer (Brad Pitt) and Peter Aufschnaiter (David Thewlis), two Austrian mountain climbers who were imprisoned by British soldiers stationed in India during World War II. 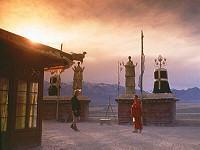 As depicted in the film, the two colleagues escape into Tibet in 1944 and find their way to Lhasa, the home of the 14th Dalai Lama (played at age 4 by Dorjee Tsering, at 8 by Sonam Wangchuk, and at 14 by Jamyang Jamtsho Wangchuk). Heinrich is entranced by the strange culture and the reverence for a young spiritual leader who is found by fate rather than chosen by man. After the boy asks Heinrich to stay and tutor him on the ways of Western civilization, the two become unlikely friends until they're separated during the Chinese invasion of Tibet in 1950. The film sparked strong reactions upon its theatrical release in 1997. There was political outrage from China, a sympathetic outcry from human rights organizations, and an overall increased public debate over the conflict. But what did most critics focus on? Brad Pitt's Austrian accent. Watching the film again, it still fascinates me that his accent was the center of a critical storm that called him everything from a "political opportunist" to a "floundering hack." To be fair, his accent is occasionally weak -- but I hardly noticed after ten minutes. Instead, 'Seven Years in Tibet' is significant because it has the allure of a Hollywood production, but the tone and value of a historical documentary. When I first saw the film in 1997, I already knew a bit about Tibet, but hadn't fully grasped the situation or the human side of the story. The relationship between Heinrich and the Dalai Lama evolves so naturally that it's instantly endearing. Pitt leads his character through a genuine arc that's as believable as it is well rounded..
Thewlis and the young actors who play the Dalai Lama are also fascinating to watch and add dimension to a film that could have easily simply been an excuse to glorify Tibet's political position. For the most part, the film doesn't vilify the Chinese as some have claimed -- while it's clear that the filmmakers have a chosen side, they do a great job of keeping the themes neutral and the conflict secondary. They're not interested in inflaming tension, instead, they just seem interested in educating people on the oppression of a nation. History buffs, on the other hand, will find a few legitimate problems. First, the film's all-too-brief runtime of two hours doesn't afford the story much breathing room. Years disappear in a matter of moments in order to provide room for the relationship between Heinrich and the Dalai Lama -- I personally would've preferred a three hour film that spent more time with Heinrich and Peter before they encounter the Dalai Lama. Second, there are key differences between the actual events as they occurred and as they're depicted in this filmed adaptation -- the biggest change being that Heinrich never described any sort of spiritual awakening during his time in Tibet. Finally, there are a few sappy uses of Heinrich's son that he never detailed and are likely to have never happened. But these inaccuracies aside, 'Seven Years in Tibet' is a revealing film that documents an important relationship that still resonates over fifty years later. People can complain about Brad Pitt's accent until they're blue in the face, but in doing so they're sadly missing out on an experience and an education of an age-old conflict. Presented in 1080p with the AVC MPEG-4 codec, 'Seven Years in Tibet' on Blu-ray boasts vivid colors and a high level of fine object detail. The image is noticeably crisp for the most part and the outdoor scenery features sharply-defined plantlife and well-rendered textures. The epic vistas are as gorgeous as ever and the mountains look inviting. Skintones are natural and interior scenes are generally dark and deep. On top of this, close-ups are extraordinary, featuring individual strands of hair, scattered stubble, and every pore the actors have to bare. Still, I had some complaints. A few hazy scenes keep this transfer a step down from perfection -- the sharpness of the background elements in these scenes consistently varies (sometimes within the same shot). I also noticed that the palette for the exterior cinematography isn't as lively as it is during interior shots -- colors are slightly dull in comparison. Finally, there are a handful of darker scenes where shadowy corners aren't as black as others (most likely a problem with the print since this flaw is found on the DVD as well). 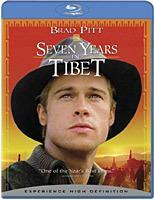 There is one additional thing worth noting -- 'Seven Years in Tibet' was released onto standard DVD in 1998 and was re-released as a Superbit DVD in 2003. The transfer on the Superbit edition was immaculate and earned praise across the board for its technical prowess. While this Blu-ray edition does look a notch better, in all honesty it isn't a huge leap above the Superbit release. 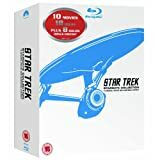 Those who own the older DVD edition should be impression by the visual upgrade on this Blu-ray edition, but those who own the Superbit DVD aren't likely to be as blown away. Thsi Blu-ray edition of 'Seven Years in Tibet' features two mixes -- an uncompressed PCM 5.1 surround track (48 kHz / 16-Bit / 4.6 Mbps) and a standard Dolby Digital 5.1 mix (640 kbps). In a direct comparison, the PCM track easily surpasses the Dolby mix. The difference is immediately apparent in the tone of voices on the PCM track, where dialogue is fuller in the without sacrificing the crispness of each word. Ambiance is also more convincing and a simple effect like a breeze blowing through the trees is more naturalistic than on the Dolby mix. There aren't many moments that take advantage of the entire soundfield, but those that do showcase a nice dynamic range with boomy bass tones. Unfortunately, the sound design is too underwhelming to make a massive impact in the world of high-def. The movie is expectedly quiet, but even chaotic scenes are subdued and fail to be as effective as they could be. The scuffles aren't well prioritized and the sound effects are sometimes stagey and distracting. Beyond these specific problems, the entire mix is plagued by hyperactive channel movement and occasionally dodgy soundfield accuracy. While it may not be readily apparent at first listen, pay special attention to the scenes involving the Chinese raids -- when soldiers move across the soundfield, their shouts sometimes jump from the right speaker to the left without panning through the center channel. To be fair, the center channel is usually being used for something important in these instances, but accomplished sound designers normally tuck panned effects beneath the dialogue. Overall, these issues I had with the audio package weren't too distracting -- the mix just didn't wow me with anything of substance. Since the film concentrates on the inherent conflicts between industry and nature, I hoped for a surround track that featured more auditory contrast. Like the previous DVD and Superbit releases of 'Seven Years in Tibet,' this Blu-ray edition doesn't offer any supplements. Pity. 'Seven Years in Tibet' isn't a perfect film, but it does do a good job of telling the intriguing true story of a chance encounter that changed the course of history. While the audio package on this Blu-ray edition is merely acceptable and there isn't a special feature to be found, thankfully the video quality is very good and provides an impressive visual upgrade to those who own the original standard DVD. Those who own the more recent Superbit DVD (which boasted its own stellar transfer) may be less impressed, but this 1080p presentation is obviously still a step up.